[Image: Irrigated geometries of the American West, courtesy of TerraServer]. 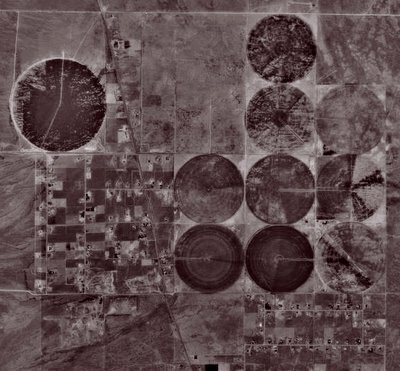 i like looking at these crop circles on google's satellite maps. MSN's black and white sattelite maps are even more detailed and you can zoom in farther, but then you miss out on the vivid colors of the agri-empire's aerial patchwork quilt!